Huntsman Lake is almost completely full after being drained for a summer upgrading of the dam and associated structures. There is a new paved area at the upper end of the lake that the public can use for launching small boats such as kayaks or canoes, but the entrance gate leading to the paved road will be kept locked, so no towed boats can be launched. Gas motors are prohibited on the lake. Wildlife is returning to Huntsman Lake. Wildlife is returning to Huntsman. Coir logs have been placed around the shoreline. These are completely biodegradable rolls that will protect the shoreline from erosion for two to five years. That will allow time for new plantings of native flora to take hold. When the water is at normal depth, the tops of those logs will be barely visible. Biodegradable coir logs have been placed around the shoreline to prevent erosion. 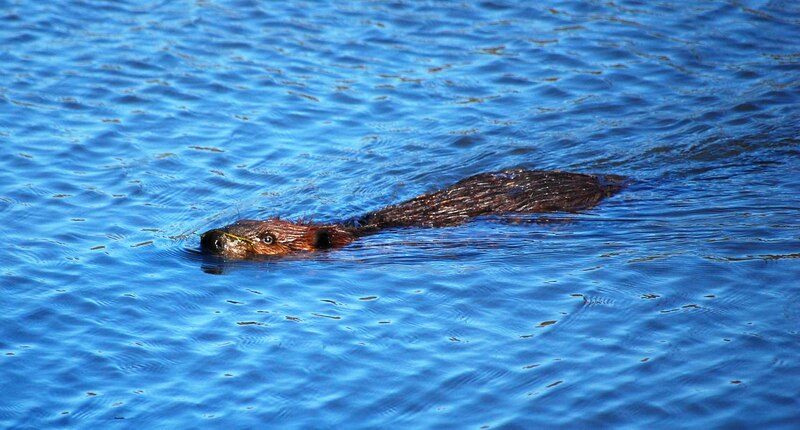 Beavers have returned to Huntsman Lake! Huntsman Lake has been restocked by the Virginia Department of Game and Inland Fisheries. Fairfax County Stormwater Planning Ecologist Shannon Curtis joined VDGIF officials on November 5 for the restocking. Curtis says officials dropped almost 15,000 fingerlings into the rising lake waters. Some bluegills were up to 4.5 inches long, but most were tiny. Officials say there were about 1,500 catfish, 8,000 bluegill and 4,500 red ear sunfish placed into Huntsman. Eventually, largemouth bass will be added to the lake. That won’t happen, though, until the forage base is allowed to grow over the next year or two, and the bass will be small when they are added. The lake remains open for fishing, however catches in 2015 will likely consist of mostly small sunfish, bluegill and catfish. Huntsman Lake is refilling after work this summer to upgrade the dam. The state plans to restock the lake, possibly as soon as November. Wildlife is already returning. A berm midway down the lake will trap sediment so that the entire lake will not have to be drained the next time sediment is removed. Work crews were planting trees along the shoreline as it refills this week. Work crews have left some debris, stumps and channels in the lake as structure that will attract fish when the lake is restocked. All that’s left to do is the landscaping. Crews were there this week planting trees and native plants along the shoreline. 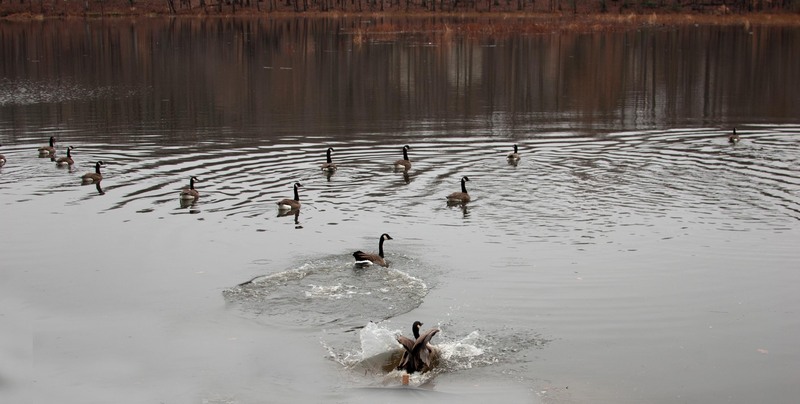 The 28-acre lake in the Pohick Creek watershed was drained last year to allow for dam maintenance. That project is well under way, and Project Engineer Jacob Edwards says people may see water returning to the lake bed in September or October. Separate projects are being conducted this summer at both ends of Huntsman Lake. Downstream at the dam, improvements are being made to the riser that stands out in the water and to the spillway, which is being extended and strengthened. Upstream, the lake is being dredged. Project Superintendent Bill Callaway says about 36,000 cubic yards of silt that has washed into the lake will be removed, leaving upstream areas about five feet deeper than they were before the lake was drained. Ecologist Shannon Curtis of the county’s Department of Public Works & Environmental Services says that trapping sediment is one of the lake’s primary functions. At the downstream end of the lake, repairs to and replacement of some of the riser is under way. The riser is the concrete structure that visitors see standing in the deep end of the lake. It houses a pipe that drains the lake into the stream below the dam. It’s the work on that riser that required the draining of the lake. That repaired riser will have a second gate in it – the original had only one – and it will have baffle irons on top to stop debris from going into the structure. The riser also will have a drain that pulls water from the lower part of the water column and sends it downstream to Middle Run below the dam, a benefit to the animals living there. Callaway says the old riser “wasn’t up to code for seismic activities.” In addition, the lake’s emergency spillway is being upgraded because of new state regulations governing dams. There’s nothing wrong with the Huntsman Lake dam. This is just an upgrade to meet the new regulations. The project offers a chance to see how a spillway is constructed and the pieces that will be underground when all is completed. Think of it as a layer cake. At the bottom is the subgrade, which is just the dirt that’s already there. Next is black geotextile fabric, a kind of sheet that is permeable, increases soil stability and provides erosion control. On top of that goes four inches of 57 stone, which are stones crushed to about ¾ of an inch in size – the kind you’d enjoy tossing in the creek as a kid. Next is the geogrid. This is the structure’s reinforcement. It’s comprised of preformed concrete blocks in 8-by-20 foot sections that lock together with cables and rebar, allowing them to have a little flexibility. Those are filled with smaller stones about 3/8-to-1/2 inch in size, and once it’s all in place you have a spillway. Callaway says that if water ever does flow down the 10% grade of the spillway, the interlocking sections will act like armor and protect the subgrade, which means the dam won’t be eroded out. It’s protection against scour, which is the damage done by running water when it scoops out holes along its path. Those are the layers of the cake. The icing is about six inches of topsoil where grass will grow, adding stability and aesthetics. Analysis of the watershed has determined that it would take 5.8 inches of rain in a six-hour period or 6.2 inches in a 24-hour period to create conditions where water would flow into the spillway in a situation called Stage II in a flood preparedness plan. Stage I occurs when the National Weather Service issues a flood watch. Stage III, which means major flooding is imminent, would be triggered by 8.6 inches of rainfall in a six-hour period or 9 inches over a 24-hour period. At the upstream end of the lake, dredging is taking place. Fortunately for fishermen, some of the stumps that were underwater in that part of the lake and that provide shelter for fish will remain. They’re in a part of the lake along the southern shoreline that will see little dredging. The added depth should be good for the lake’s biodiversity, and there may be fish structures added to the lake. Curtis says the heavy rains of early June made sediment control challenging, but they are working with the contractor to remove as much as possible from the lake bed. Also in the plan are native plantings around the shoreline, which may give the lake a different look than it had prior to the current work. Edwards says those plantings likely will be put in place in September or October. The Virginia Department of Game and Inland Fisheries will then restock the lake next spring. Dredging operations are expected to be completed this summer, possibly by the end of July. After silt removal on the upper end of the lake is completed, officials say the two small creeks that feed the lake at the lower end of the lake may also see some silt removed. Some of the silt removed during the dredging is being recycled as topsoil through facilities in Virginia and Maryland. Tests showed no dangerous levels of any contaminants in the silt. There’s no target date for returning the lake to its normal, historic level. There are regulations that set the amount of water that can be retained in a lake as it refills following dam maintenance, and nature has a say in the amount of precipitation that falls. Lakes Woodglen and Royal are in line for future dredging, but there’s no set schedule for when that will happen. Officials say some of Woodglen’s fish might be moved to Huntsman. Department of Public Works and Environmental Services Project Manager Charles Smith says those lakes may be dredged “in the wet,” which means there will be no draw-down and the silt will be removed either by machines on barges or by hydraulic dredging using pipes and pumps. In the meantime, look for the Huntsman Dry Bed to start becoming Huntsman Lake again later this year. 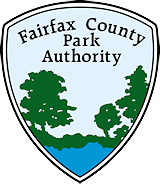 Author Dave Ochs is the manager of stewardship communications for the Resource Management Division of the Fairfax County Park Authority. This entry was posted in Uncategorized and tagged Department of Public Works and Environmental Services, Huntsman Lake, Pohick Creek on June 27, 2014 by Fairfax County Park Authority. Thanks for this great update as we’ve been wondering for months what’s going on. I wonder if during this construction there is a plan to make a complete path around Hunstman Lake (similar to Burke Lake). It would be great to be able to walk around the lake safely for recreation and parts of the lake haven’t had a clear path. I agree about a path!!! I hope the bald eagles will be enjoying their snacks there now!! Its a joy to see them. There are picnic tables and trash cans located in the developed area of the park at the end of Dorothy Lane. There is also a trash can located at the lower end of the service road to the dam. Just went fishing there today. Didn’t catch a thing. If you want to step in dog poop every 10 seconds, this is the place for you! Sorry you did not catch anything. We are passing along your concerns regarding dogs to the Area Manager. Folks should be considerate of others. Thanks for the feedback. Why can’t boats on trailers be launched here, all this money spent on a paved road and a boat ramp for canoes and kayaks? I have an aluminum boat with an electric motor but it needs to be launched from a trailer. 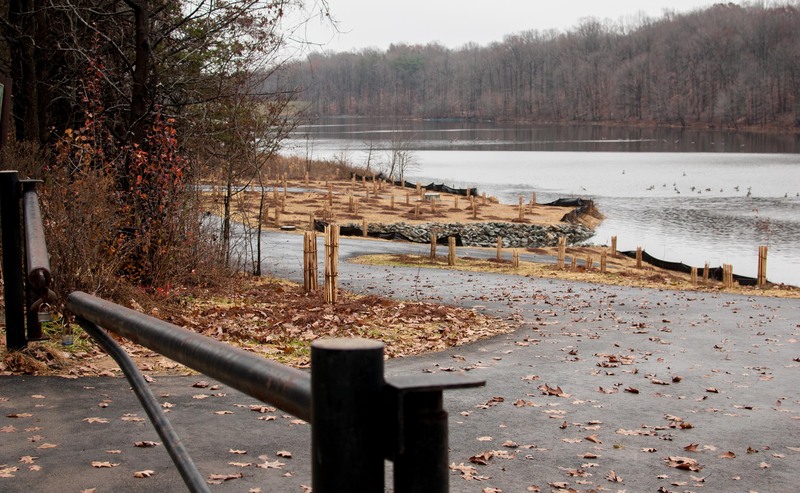 Would Fairfax County Park Authority entertain the idea of allowing boaters to purchase a key to the gate like Bull Run does in Manassas? The boat with electric motor you describe would violate the posted Huntsman Lake regulations adopted by the Board of Supervisors. The regulations only allow for the use of non-motorized boats.